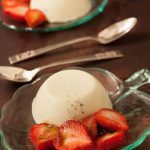 Light creamy panna cotta, flavoured with basil and served with balsamic strawberries and black pepper. This unusual and easy dessert makes an elegant and sophisticated dessert end to a meal. Place the milk, cream and sugar in a small saucepan and heat gently, stirring until the sugar has dissolved. Bring to a simmer and remove from the heat. Shred the basil and stir into the hot cream. Allow to stand for 1-2 hours. Soak the gelatine in a little cold water until soft. Strain the the cream mixture through a fine sieve. Return to a clean sauce pan and gently reheat until just simmering. Squeeze the water out of the soaked gelatine and stir into the pan, stir until the gelatine has dissolved then remove from the heat. Divide between 4 ramekins or small bowls. Chill for at least 2 hours or until set. Just before serving, slice or halve the strawberries and sprinkle with the sugar and vinegar. Turn the panna cottas out onto small serving plates and spoon the strawberries around the edge. Sprinkle the panna cotta and strawberries with a little black pepper.